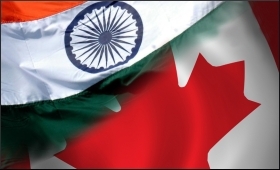 Canada hopes the Comprehensive Economic Partnership Agreement (CEPA) with India will be concluded by the year-end but believes the next round of negotiations likely next month will be crucial for making progress. "We are optimistic that when we have the next round, we could be moving more quickly to a resolution. It depends on ambition on both sides. There are certain things India is looking for and there are certain things we are looking for," Canadian High Commissioner to India Stewart G. Beck told IANS in an interview here Friday. The high commissioner said the studies show that CEPA would add $6 billion in trade both ways. Pointing out that both the countries have concluded Foreign Investment Promotion and Protection Agreement (FIPPA), he said Canada was waiting for India to sort out some issues it had with the agreement. India has put on hold FIPPAs with 83 countries after some companies challenged its decisions on 2G spectrum issue in the international arbitration. "They (the Indian government) are doing investigations and review of all FIPPAs. After that process, they may come back to us for re-opening and some changes," the high commissioner said. "Companies making big investments in India will feel their investment will be protected. FIPPA is important but I will not say it will translate into investment of billions of dollars," Beck said. The high commissioner said the target set by the two countries for a three-fold increase in the bilateral trade to $15 billion by 2015 was not an easy one. He said while commodities like pulp and pulses directly come from Canada to India, there were lot of products that go through third markets. He pointed out that 80 percent of the diamonds mined in north western territory of Canada come to Surat for cutting through a third market. Pointing out that Canada caters to 25 percent of lentils market in India, he said while the focus will continue on food security, Canada was also look at opportunities in food logistics and dairy genetics. "On energy side, oil and gas is something we can supply to India on long term. We have huge oil and gas reserves and a population of 33 million. That makes sense for us to enter into this long term relationship with India," the high commissioner told IANS. He said large Canadian pension plans were interested in the Indian market and they could finance infrastructure projects here. Referring to India's move to allow foreign universities, he said many Canadian universities had evinced interest in starting their own programmes or having joint ventures with Indian institutes. Beck believes the real big opportunity lies in vocation training. Canadian institutions have the opportunity to come to India and give vocational training for skill development as millions of people will be entering workforce in 10 to 15 years, he said. "Some of them already have bilateral programmes with local universities. Given the demographic dividend, it is going to be tremendous opportunity," he said. Beck said the number of Canadian companies which are active in India has gone up from 250 to 600 in last two and half years. He said they were educating Canadian companies to look at India on long term and adapt to the Indian market. "If you are sitting in Canada and read press about India you will say why should I do business in India. Scandals, rupee falling and news that will suggest India is not the best place to do business but when you sit down and explain them opportunities in India, particularly sectors where India has requirements, we find easy to convince companies that India is good place to do business." He said they were bullish about the long term prospects of the Indian economy in view of its sheer size and the number of people moving into the middle class.